BRASILIA --- On Friday (March 16), at the IVECO industrial complex in Sete Lagoas (Minas Gerais state), a ceremony was held to mark the delivery of the 300th Guarani Veículo Blindado de Transporte de Pessoal (armored vehicle, personnel transport – MR) to the Brazilian Army. The vehicle was developed in partnership with the Armed Forces to replace the Urutu and Cascavel wheleed armored vehicles. "We have arrived at an important point, the delivery of the three hundredth vehicle to the Army, which shows the robustness and continuity of the partnership we have with IVECO on our strategic Guarani program," said the head of the Army's Strategic Projects Office, General Guido Amin Neves during the event. 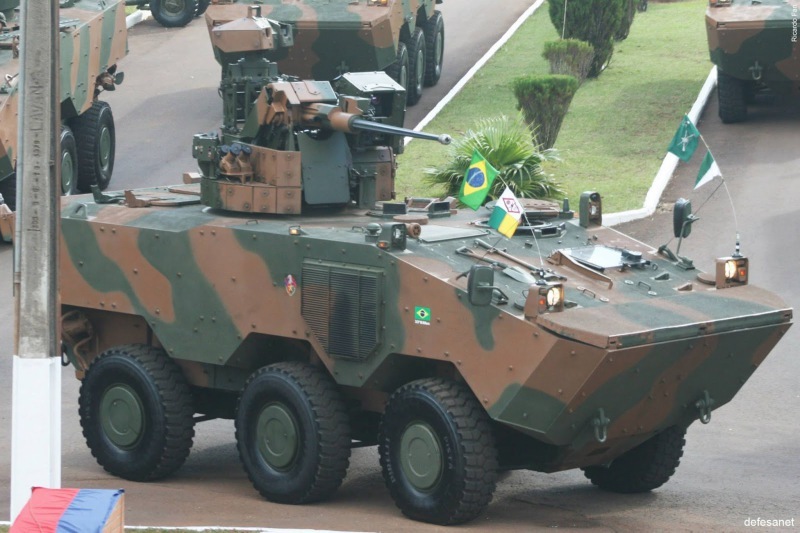 The Guarani VBTP-MR was developed for the modernization of the fleet of the Brazilian Army, which maintains the intellectual property rights to the new armored vehicle. The vehicle can carry up to 11 people, weighs 18 tons, has six-wheel drive, can reach speeds of 110 kilometers per hour and also has an amphibious mode. It includes a series of technological innovations, such as automatic fire detection and extinguishing system, low thermal and radar signatures, which hinder its location by enemies. It can also operate on border control and peace-keeping missions. The continuation of the Guarani strategic project provides for the 6x6 platform, similar to the one delivered, in a quantitative of 60 vehicles per year, which corresponds to the contract with IVECO up to a total of 1,580 vehicles. "Among these vehicles, we have several versions. We are now taking delivery of troop transports, and we have other versions, such as Command and Control, Communications, Mortar and several others that complete the Brigade system, according to the operational module adopted by the Army, which is able to fight on its own,” said General Edson Henrique Ramires, the Army's current project manager. The partnership with the company began in 2007 and was consolidated in 2013 with the inauguration of the first IVECO Defense Vehicles factory outside Europe. In addition, the company will be the supplier of the new LMV Multi-Role Armored Vehicle (VBMT-LR). The assembly of this new vehicle, as well as the production of the Guarani, will also take place in Minas Gerais. The ceremony was attended by the Minister of Planning, Development and Management, Dyogo Henrique de Oliveira; the Chief of Staff of the Brazilian Army, General Fernando Azevedo e Silva; of the Army's Logistic Commander, General Theophilo Gaspar de Oliveira Neto; the president of CNH Industrial for Latin America, Vilmar Fistarol; the Italian ambassador to Brazil, Antonio Bernardini and the director of Iveco Defense Vehicles, Humberto Spinetti. The initiative promotes the National Industrial Defense Base (IDB), a measure recommended by the National Defense Strategy (NDT), in generating jobs, training, technological innovation and providing dual employment of materials developed in partnership with the Armed Forces.